The Church of St Peter and St Paul, Cosgrove is the oldest building in the village. 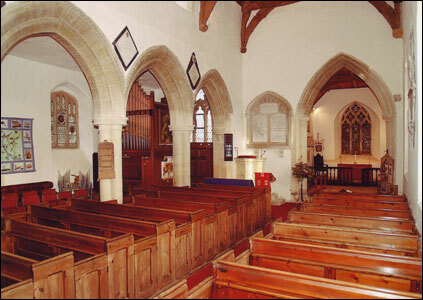 Built of local stone, it has a chancel, a nave, a north aisle and a West Tower. In 1934 electric light was installed in the church. A fresh survey of the fabric by Lawrence Bond in 1955 revealed the need for a good deal of work, including repairs to the walls and roofs. In 1962 Bond recommended further work, including the re-roofing of the chancel. All his suggestions had been carried out by the time of the next quinquennial inspection in 1967, when the Gurney heating stove was worn out. Electric heating was installed in 1968 and a new blowing plant for the organ in 1971. An Upper Room, kitchen and toilet were constructed during Millennium alterations. 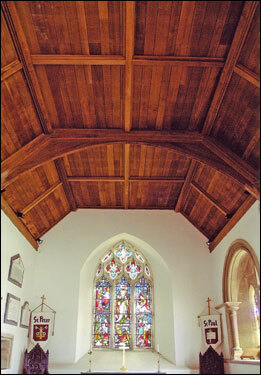 The chancel of Cosgrove SS Peter and Paul church has recently had a £2000 facelift, including a new oak ceiling. Tiles on the roof have been replaced and the walls and masonry repaired. The cost of the roof and the repair and re-decoration has been twice as much as first estimated, and although £1000 has already been paid the church members are now faced with finding another £1044. The gift day will be held in the parish in October and members of the Wolverton Methodist church have offered to help. The Methodist Church choir under its conductor, Mr. Arnold Jones, will be giving a concert in aid of the Cosgrove Church Restoration Fund in the church on September 11. Mr. Lewis Clarke will be the accompanist and will also give organ and harpsichord solos. Other solos will by Mrs. Kathleen Jones (soprano) and Robert Jones (recorder). Hymn Board “In Memoriam” Inscription. The 2008 churchyard project lists the Grahams and William Moorsom as being buried in adjoining plots near to the “obelisk” memorial of Joseph Atkinson. Elizabeth Graham was born Elizabeth Moorsom in Whitby, Yorkshire around 1814 and William Moorsom was her brother, the two being the children of Richard Moorsom, brother of Sir Robert Moorsom of Trafalgar. Sir Robert Moorsom's nephew William Moorsom (18161860), naval officer, was ‘Shell Moorsom’, inventor of the percussion fuse. Born on 7 February 1816 at Airy Hill, Whitby, the son of Richard Moorsom (17581831), shipowner and marine merchant, and his wife, Barbara, née Craig (17801832), he attended the Royal Naval College, Portsmouth (182930), gaining the first medal, and passed the lieutenant's examination in June 1835 but was not commissioned lieutenant until 1842, with the Cornwallis in the First Opium War. In 1854, in the Crimean War, he was appointed captain of the Firebrand but served ashore with the naval brigade, having a large share in its organization. Wounded and twice mentioned in dispatches, he was a CB, a chevalier of the Légion d'honneur and a knight second class of the Mejidiye. Known as Black Will when shaving was compulsory in the navy he was, on his return from the Black Sea, ‘the first captain who had the temerity to invade the sacred precincts of the Admiralty with hirsute “fixings”’, to be met with ‘the cutting remark: “Horseguards next door!”’ (Clowes, 6.21112). William Moorsom was described fifty years afterwards as ‘an officer of high scientific attainments’ (Garbett, 30). His ‘Moorsom percussion fuze’ of 1850, though obsolete fifteen years later, was the first satisfactory metal percussion fuse for the navy. He also invented the ‘Director’, an instrument for concentrating a ship's broadside, perfected and in use forty-five years later. He was the author of Remarks on Concentrating the Fire of Ships' Guns (1846), Suggestions for the Organisation and Manoeuvres of Steam Fleets (1854), and Remarks on the Construction of Ships of War and the Composition of War Fleets (1857). In 1857 he was appointed to the screw frigate Diadem in which, while recovering from a severe attack of smallpox, he was sent to the West Indies and to Vera Cruz, where he contracted a fever. On his return to England he was compelled to resign his command in October 1859. 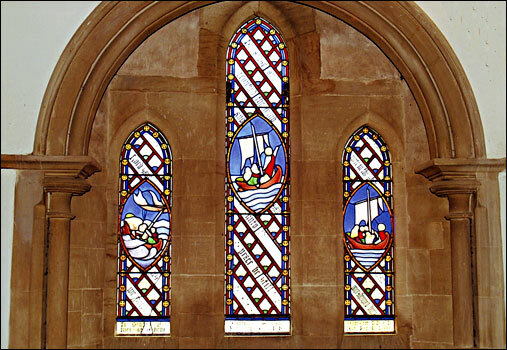 He died suddenly on 4 February 1860 at Vernon Terrace, Brighton, Sussex, and was buried a week later at Cosgrove, Northamptonshire, where there is a stained-glass window to his memory in the church. Elizabeth Graham was born Elizabeth Moorsom and was William's sister. By an Indenture dated 22nd March 1862 and made between the Rev John Graham, then Rector of Cosgrove and the then Churchwardens of the one part and Mrs Elizabeth Graham of the other part, after reciting that Mrs Elizabeth Graham had out of her own separate monies purchased the sum of £166 13s 4d. Consolidated 3 per cent annuities and had caused the same to be transferred into the names of the Rector and Churchwardens, it was declared that the said sum of stock should be held by the Rector and Churchwardens on trust to apply the dividends thereof for the maintenance and benefit of the National School in Cosgrove in such manner as they should from time to time think proper, provided always that in case the said National School should at any time thereafter cease to be carried on or should be managed or conducted in any other way or for any other purpose than as a Church of England school for the benefit of the children of the labouring classes in the said parish of Cosgrove, then and in such case the trust fund should be held in trust for the said Elizabeth Graham, her executors, administrators and assigns: and it was agreed that, on the death of the said John Graham, and on the death of his successors, Rectors of Cosgrove, the trust fund should be so transferred that it should stand in the names of the Rector and Churchwardens for the time being, the expense of such transfer being paid out of the dividends of the trust fund and not out of the corpus. Cosgrove National School is comprised in two deeds, dated respectively 19th April 1844 and 18th February 1870, and is now regulated by a scheme of the Charity Commissioners, dated 9th April 1875. The scheme provide (inter alia) that the School shall be at all times open to the Inspection of His Majesty’s Inspector of Schools, and shall be in union with, and conducted according to the principles of the National Society. The School has accommodation for 98 children and an average attendance of 71. The annual income, amounting to £4 3s 4d, has been applied towards the maintenance of the School. The Stock is standing in the name of Messrs H Grant Thorold and F D Bull. John Graham was rector of Cosgrove between 1835 and 1869, a period which, as elsewhere, saw the establishment of a National school and the restoration of the parish church, (fn. 78) although he seems not to have made the same mark on either the parish or wider church life in the district as, say, H. J. Barton at Wicken, Barwick Sams at Grafton Regis, or W.H. Newbolt at Paulerspury. The Rev. John Graham, M.A. Fellow of Queen's College, Cambridge, has been instituted by the Lord Bishop of Peterborough, to the Rectory of Cosgrove, in this county, vacant by the death of the Rev. Henry Longueville Mansel, on the presentation of Mrs. H. L. Mansel. The Census of 1851 reveals that Elizabeth and John Graham had three sons and a daughter, all born in the Rectory at Cosgrove. 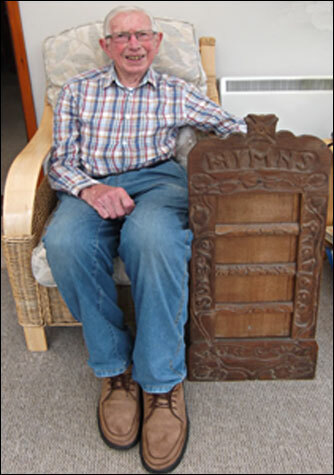 The Hymn board was mended in 2016 by David Blunden, of Old Stratford, who also made the memorial stool dedicated to Basil Richards. David trained with Betts and Faulkner, a local building company, and David’s maker’s mark is stamped on the underside of the stool. During this restoration the memorial inscription on the reverse of the board was revealed as well as a provenance note to the effect that the board was carved by Harry Johnson of Cosgrove in 1911 or 1912. Harry’s story can be found here. 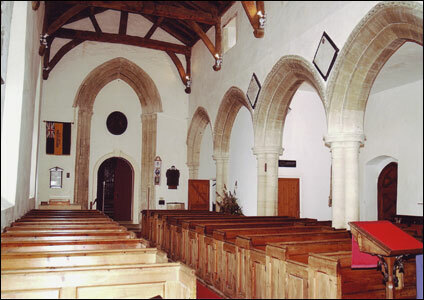 The Nave has a 13c five bay arcade (a range of arches resting on piers or columns) with quatrefoil piers, carved bases and capitals (head of column or pier), double chamfered arches and toothed hood moulding. The south wall and its windows are now entirely Victorian, although the parapet originally held a date stone from 1586, which is now set in the north wall behind the font. There is local belief that this marked a partial rebuilding of part of the church damaged by an outbreak of fire at that date, but no information about this fire can be found. Reset in the nave windows are three shields of armorial glass. A faculty of 1683 records permission to "pave the Church all over with broad stone from Harleston". An old photograph showing the oil lamps used in the church before electricity arrived in the village. The cornice above the arcade to the left of the picture marks the ceiling that was "new-ceiled" by Pulter Forester in 1771. 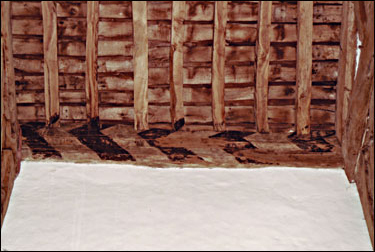 When this was eventually removed the older Kingpost roof beams were revealed and the line of the removal can be seen in photographs below. 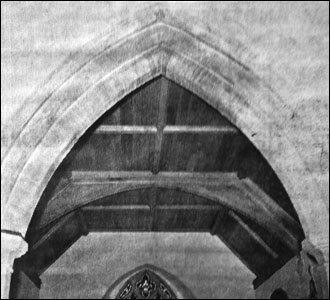 Arthur Mee, in his book "Northamptonshire" noted that "on the wall above the chancel arch are fragments of a medieval painting". It has been inspected and a tentative title of "Christ in Judgment" suggested. If this is so, it is now covered in limewash. of the roof on the left, before the Chancel. View of the roof from the West end of the Nave . 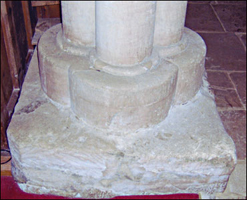 The roof of the Nave is of 15th century Kingpost construction, described as “rather rough” and having the remains of painted chevrons, probably originally vermilion or perhaps cobalt blue, above the pulpit together with wall posts on corbels. Two trusses to the east half of the roof have stop moulded ties, raised principles and side struts from ties to principles. Those to the west are probably early 17c with bar stops to ties and side struts to principle rafters. The interior of the church was repaired, the ceiling coved and plastered, the windows reglazed, and a new font, pulpit, desk and pews installed by Pulter Forrester in 1770-4. 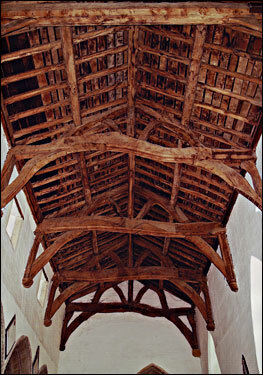 The roof was rediscovered when the Nave was repaired in 1932 and properly exposed. The Pews date from a c18th renovation. Some still have boxes to store the books of families who rented the pew. 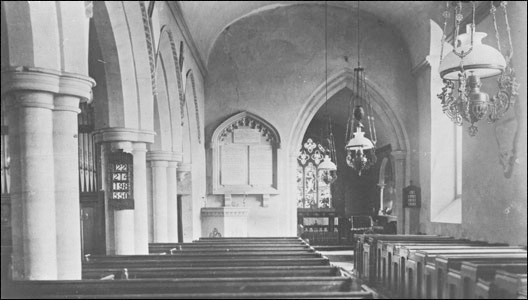 Two of the pews near the back belong to the two Churchwardens and have their staffs of office fixed to the ends. These were used to control unruly churchgoers and to make sure that men removed their hats. They are only used for processions now. The front pews were removed in the late 1980s to allow space for performers in concerts and services. Entering via the West door it is easy to see that the chancel and nave are off set and not in the same alignment. This configuration lends credence to the belief that the chancel is the earliest part of the Church, dating from the late 11th century. It was probably enlarged in the late 12th century. The original design of the east wall may have comprised a triplet, with a central window flanked by lower lights under a gable with reticulated tracery and hood mould. From the outside at the rear of the east end of the chancel can be seen an external string-course decorated with nailhead and beading, and the remains of grouped eastern lancets cut by the 14th-century east window, from which the original stained glass has long gone. Whilst the technique of chip carving was common in the late 11th c, it appears here to represent an early form of dog tooth, possibly a late 12th century version (c1180). The stringcourse returns along the south wall of the chancel, but not along the north side. While the stringcourses and labels on the east wall appear to be original, much of the stringcourse on the south wall is a Victorian imitation of the work done in the 12th century. The Churchwardens' account for 1861 records the following work : "The Chancel of Cosgrove Church was Beautified in 1861 by two Stained glass Memorial Windows with new stone Work to the same placed therein by the Rev John Graham the Rector at a cost of £67 10s and in 1865 further improvements were made by the Rector having the Chancel thoroughly repaired and a Handsome new door erected New seats placed New altar rails &c at a further cost of £113 16s." 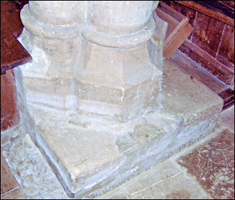 The side walls of the chancel were rebuilt in the 19th century, but a medieval flat topped aumbry with diagonal tooling still exists on the north side of the sanctuary, which originally would have stored books, altar plate and relics. From the outside of the north wall of the chancel at the west end a high level doorway can be seen. 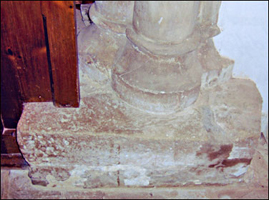 These features suggest that the chancel could originally have been a small free standing chapel with a west gallery. During a rebuilding of the chancel roof and part of the walls in the mid 1960’s, two small 12th century corbels were found ‘in the rubble’ and reset under the new roof, one on the south and one on the north sides. They each show a human head with bulging eyes. 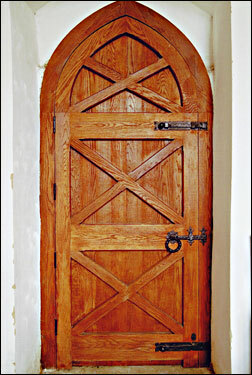 The pointed, chamfered north doorway (the Priest’s door) also has a label carved with a sawtooth, although dated 1864. 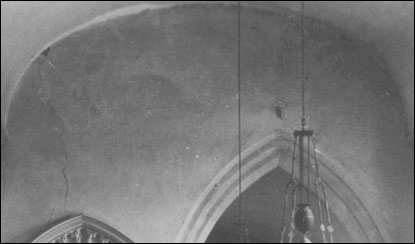 In 1932 a stone cross, to a design by Weir, was placed on the eastern gable of the chancel in place of one which was blown down some years earlier. Behind the 13th century arcade is the North Aisle. In the 1830s the church was described as well paved and pewed, with a north gallery and another across the west end, both added in 1826, of which the latter contained a small organ. There was a blocked doorway (already out of use in 1764) in the north wall, which is speculated to date from 1280. In 1864 the vestry resolved to re-seat and refloor the church, replace and move the pulpit and desk, restore three windows on the south side of the nave, and make a new entrance to the north gallery, which gained the church about 30 seats. The work was carried out to the design of E. F. Law. 1864 Law and Hailey Renovations. In what is now the North aisle there was until 1887 a gallery, to which the bricked-in doorway apparently led. However, in 1887 the good people of Cosgrove applied to the Bishop of Peterborough for a faculty to have the gallery removed as "an Eye Sore" and also on the grounds that the entrance being outside enabled "idle lads and strangers to go in during Divine Service to the annoyance of the congregation". It is amusing to speculate on just what they did to annoy the people at prayer below. During the Millennium celebrations of 2000, Lottery and other grants were obtained to open up the North door for disabled access, to install a toilet and small kitchen, and to build an Upper Room above this for meetings. The upper floor cut across the “Wineglass window” with a wooden balcony. The Judge ordered the order to stand as it is unless Mr Whaley can shew good cause to the contrary Satterday in next Easter weeke. 1764 A Faculty granted to Pultar Forester at the petition of Nathan Franklin to construct a Family Pew. William Connor by Divine permission Bishop of Peterborough To all whom it may concern more especially to the Rector Churchwardens Parishioners and Inhabitants of the Parish of Cosgrove in the County of Northampton and within our Diocese and Jurisdiction. And do hereby give and grant unto the said Rector and Churchwardens our leave license or Faculty for the purpose of removing the Gallery in the North Aisle of the Parish Church of Cosgrove in manner aforesaid. In Testimony whereof we have caused the Seal of our said Vicar General (which we use in this behalf) to be affixed to these presents Given at Peterborough the eighteenth day of April in the year of our Lord One thousand eight hundred and eighty seven and of our consecration the nineteenth.